Led by Patrick Mahomes, the Chiefs have been almost unstoppable on offense. SANTA CLARA, Calif. — Jon Gruden knows he sometimes went over the top in his praise of quarterbacks in his old job as an analyst at ESPN. It seemed like any time a quarterback went to “Gruden’s QB Camp” or was picked in the draft, Gruden was full of compliments. But the praise for Kansas City‘s second-year star quarterback, Patrick Mahomes, is on an even different level. “His overall skill set is sickening. It really is,” Gruden said. “He’s double-jointed. He can throw the ball from any platform possible. Running to his left, fading backward. He can get out of trouble. I compliment everybody, I’ve been accused of that, but this guy has off-the-chart arm talent. Skill level is unbelievable. Gruden’s task this week was to devise a plan to slow Mahomes when his Oakland Raiders (2-9) host the Chiefs (9-2) on Sunday in what appears to be a major mismatch. Led by Mahomes’ 37 touchdown passes — the third most ever through 11 games — the Chiefs have been nearly unstoppable on offense. Coach Andy Reid’s squad ranks second in the NFL with 404 points and is on pace to become the first team since at least 1960 to average more than 7.0 yards per play. 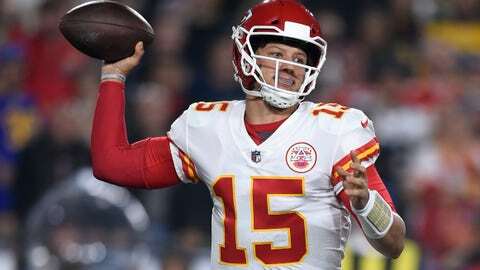 But not everything has been perfect for Mahomes, who committed five turnovers in Kansas City’s last game, a 54-51 loss to the Rams on Nov. 19. Chiefs safety Eric Berry returned to the practice field this week for the first time since the early weeks of training camp, when he was sidelined by a heel injury. But considering Berry has not played at all since August, it is unlikely he will be available for Kansas City’s trip to Oakland. One thing the Raiders have done well this year is start games fast. Their 34 points on the opening drive rank fifth best in the NFL. What’s happened after that has been the problem. Oakland has the third-worst offense the rest of the game, averaging just 1.32 points per drive after the first one. Chiefs defensive tackle Chris Jones was the AFC’s defensive player of the month, another line to a resume that could land him a big contract extension this offseason. Jones has nine sacks this season, including at least one each of the past seven weeks. He had a pair of sacks against the Cardinals and the Rams prior to the bye week, and he had a season-high three tackles for loss in Los Angeles. Oakland was burned last week by a poorly placed punt by rookie Johnny Townsend that led to a 70-yard touchdown return by Baltimore’s Cyrus Jones. Townsend, a fifth-round pick, has struggled this year, ranking 30th out of 32 qualifying punters in net average (37.7 yards), last in gross average (43.5 yards) and last in percentage of punts downed inside the 20-yard line (18.4 percent). That could be an issue against Tyreek Hill, who leads the NFL with four punt return TDs since entering the league in 2016. The relationship between Gruden and Reid goes back decades to when they spent three years together as offensive assistants on Mike Holmgren’s staff in Green Bay from 1992-94. That’s where the two started to build the foundation of the offenses they’d eventually run for years as successful NFL head coaches.